Sickle cell disease (SCD) is a blood disorder, which has been studied using different research methods including linear birefringence, electronic microscopy, viscosity determination, Electron Paramagnetic Resonance and Nuclear Magnetic Resonance. 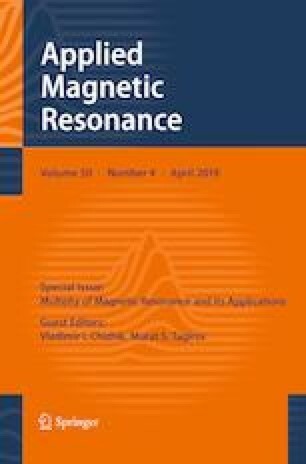 We summarized in this paper the contribution of proton magnetic relaxation, to the study of the behavior of the protons from protein and water as a consequence of hemoglobin S (HbS) polymerization. Spin–Lattice (T1) and Spin–Spin (T2) relaxation times have been sensitive to the agglutination of the HbS, having a decreasing behavior because of this process. T2 has shown a stronger sensitivity, decreasing immediately during deoxygenation in red blood cells (RBC) of patients homozygous for HbS and in pure HbS solution with intracellular concentration. In the HbS solutions with hemoglobin concentration below 208 mg/mL and heterozygous RBC, during induced deoxygenation, the Spin–Spin relaxation time was characterized by a delay time before polymerization, a decrease during aggregation and a further stabilization; the same occurs in the HbS solutions under spontaneous deoxygenation. The fast exchange of water molecules between the bound and free state, as well as the dipolar interaction between the protons inside the water molecules, were utilized to explain the relaxation times behavior; an increase in the correlation time of the strongly bound water was found. Contradictory results were observed between the experimental behavior obtained for T1 and those results predicted theoretically. T2 behavior showed utility to evaluate the clinical state of the SCD patients and the effect of vanillin and Hydroxyurea on the HbS polymerization. This work has been supported by the Belgian Development Cooperation through VLIR-UOS (Flemish Interuniversity Council-University Cooperation for Development) in the context of the Institutional University Cooperation program with Universidad de Oriente. The authors also would like to thank the MRI RESEARCH CENTRE of the University of New Brunswick, Fredericton, Canada, for all the support received to finalize this work. Likewise, the authors would like to express their gratitude to Professor V.I. Chizhik for his fundamental contribution to the founding and development of our MR center and to Professor R.N. Muller for the discussion and for the opening of new possibilities in the continuation of these works.